I remember when I was sixteen and going to take my driving test for the second time (why does the state of Washington require you to back around a corner within one foot of the curb? I have never seen any driver do that) – I was telling myself I could do this. I thought to myself, millions of other people have done this: look at this guy driving next to you – he’s missing all his teeth but four and he has done this. Everyone driving around you has done this. You can do this too. I have used that logic to talk myself into being able to do things since then, too. When I went into the hospital to have Gracie, I told myself almost every woman I knew had done this, some multiple times without drugs. When I went to countless interviews after being laid off and was getting tired of being rejected again and again, I told myself there are millions of jobless people out there doing the same thing (then later I started protesting unemployment claims and realized there are millions of unemployed people, but they certainly aren’t all out seeking employment). Just yesterday I was behind this infuriating woman in the return line and then she huffed right past me and cut in front of me two feet before the checkout line and paid with a bag of silver coins. I told myself every day people get upset and bottle it in and I would just have to be patient and not tell this fat, ill-dressed woman wearing a scrunchi exactly what I thought about her. Trust me, I had plenty to say, but I bit my tongue. In the last seven days, I have been telling myself that millions of other people have kids, some in much less ideal situations than my own, and they have been successful parents, so I can be, too. So if two people like us found this last week to be tough, I can’t even imagine how other people do it. Single moms amaze me. I couldn’t have made it through these last seven days without Steve constantly by my side to help with the diaper changes, outfit changes, sponge baths, and feedings. Tomorrow Steve is going back to work, but he will still be here in the evenings and on the weekends to help with all that, all while bringing home an income for us to survive on. Single moms don’t usually have anyone that helps out like that. Or parents of multiples – how do they do it? My brother-in-law has twins and how he and his wife made it through that first year all in one piece amazes me. I mean, I thought it was impressive before, but now I think it’s downright staggering. Steve and I have already noticed a change in ourselves. He talked about kids with the dental hygienist today and both him and I hated when people used to talk about their kids to us. Now we’re going to do it all the time. We’ll be the ones younger people roll their eyes at, not to. Every day we’re changing, adapting to our little boy, morphing into parents, rather than a married couple who just had a baby. Millions of other people have done it; we can too. 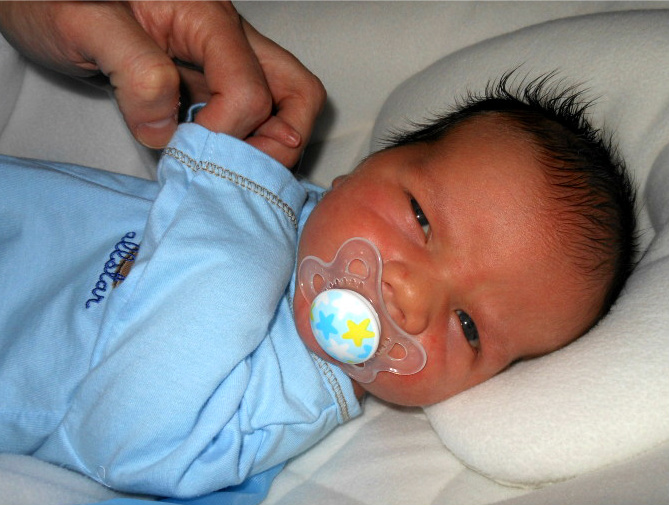 look at how big that tiny paci looks in his little mouth. so sweet. hope he likes those pacis. can't wait to hold him again… he is giving me serious baby fever. must.finish.school.before.procreating.again. He is so beautiful. He is so lucky to have the both of you as his parents.